The House That Ruth Built gets a theatrical exploration in playwright and Director Eric Simonson's Broadway play The Bronx Bombers. Baseball legends abound in this story conceived by Frank Kirmser and produced by the same team that brought us the sports-themed Broadway productions of Lombardi and Magic/Bird. Making appearances are Babe Ruth (C.J. Wilson), Lou Gehrig (John Wernke), Joe DiMaggio (Chris Henry Coffey), Elston Howard (Francois Battiste), Reggie Jackson (also Battiste), Thurmon Munson (Bill Dawes), Mickey Mantel (also Dawes) and even Derek Jeter (Christopher Jackson). The story gets caught in a double play, however, with dream-like sequences with the legends tagging out a different plot path about what it means to be a New York Yankee and live up to the club's image. Told through the eyes of Yogi Berra (a very good Peter Scolari), the first act focuses on a 1977 fight between manager Billie Martin (Keith Nobbs) and Jackson. Berra solicits the help of Munson to try to make peace, but later he shares a secret with his supportive wife, Carmen (Tracy Shane): team owner George Steinbrenner just might offer Martin's job to him. Suddenly the Babe comes to offer Yogi some advice and the other legends arrive for an oldtimers banquet. Somewhere between a dream and "Field of Dreams," the action, made misty with a fog effect, is sometimes difficult to follow. Also throwing some curves are a comedic side plot about the delivery of lots of potatoes and a bunch of those Yogiisms for which the Hall of Famer, who will be 89 this May, is famous http://www.yogi-berra.com/). Simonson's script should have received more development before bringing it to a Broadway stage and his direction can be tedious at times (how many times can the actors move to a cart and grab a beverage?) The casting is good, though, with many of the actors looking and sounding like the players they're pinchitting for on stage. Scolari, in particular, creates a consummate Berra, complete with facial expressions, mannerisms, stride and ears that stick out. He perfects his craft by physically aging the character. If you're not a Yankee's fan -- and an older one who remembers the pre-Jeter players and the events being discussed to boot -- it's unlikely you'll feel engaged despite the team logo on the floor or the white trim over the stadium-like seating arrangement at Circle in the Square Theatre (set design by Beowulf Boritt). The show runs about two hours and 10 minutes with an intermission. 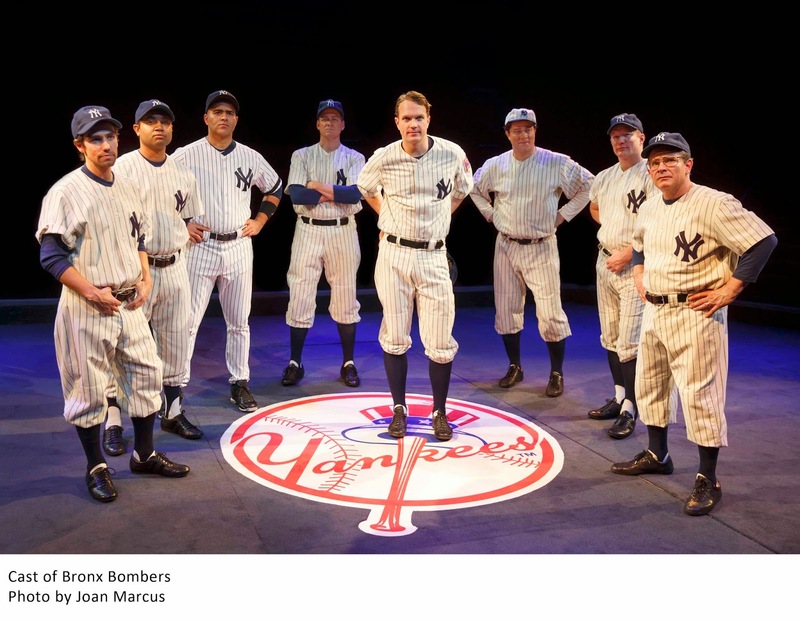 Bronx Bombers are at bat until March 2 at Circle in the Square Theatre, 235 W. 50th St., NYC. http://www.bronxbombersplay.com/. 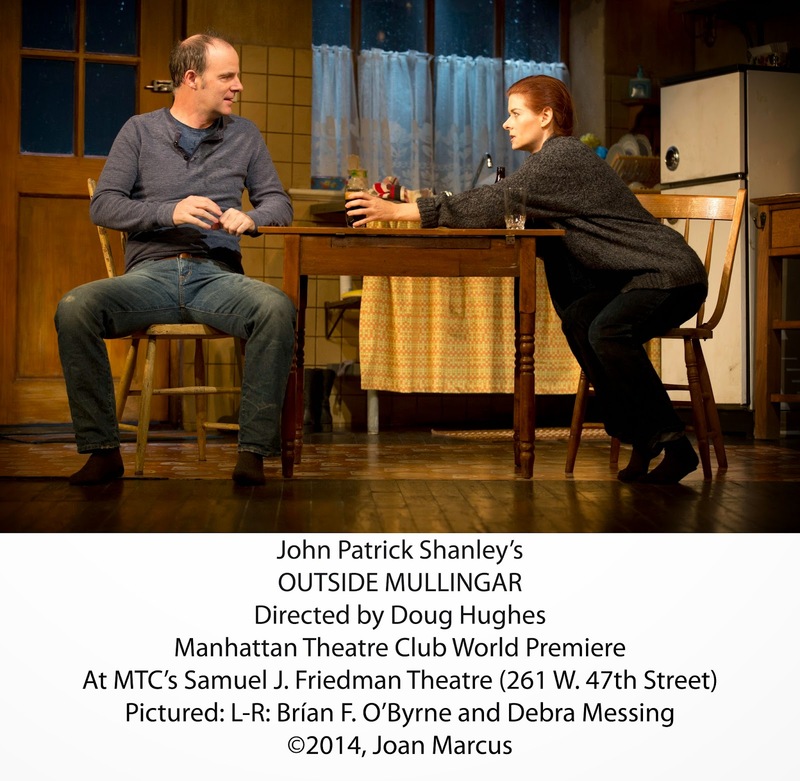 John Patrick Shanley's newest Broadway entry, Outside Mullingar, is a wee delight. Well, not so wee. This lyrical, charming and surprising play getting a run by Manhattan Theatre Club is hugely satisfying. In fact, it's one of the most enjoyable shows of the season so far. 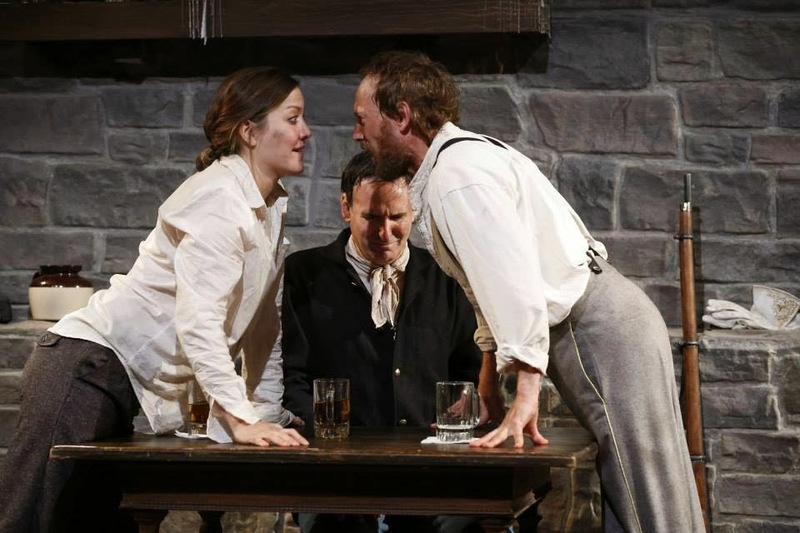 The always-excellent Brian O'Byrne (Frozen, Doubt), and TV star Debra Messing ("Smash," "Will and Grace"), who is impressive in her Broadway debut, team as two aging misfits in the midlands of Ireland who watch life pass by. Anthony Reilly (O'Byrne) has worked his family's cattle farm all of his life, but suddenly, his disapproving father, Tony (Peter Maloney), starts hinting that he might disinherit his son who's never married and had a family. More importantly, he doesn't seem to enjoy the work. "I don't take joy in the work," he says, "But I do it. Some of us don't have joy, but we do what we must." 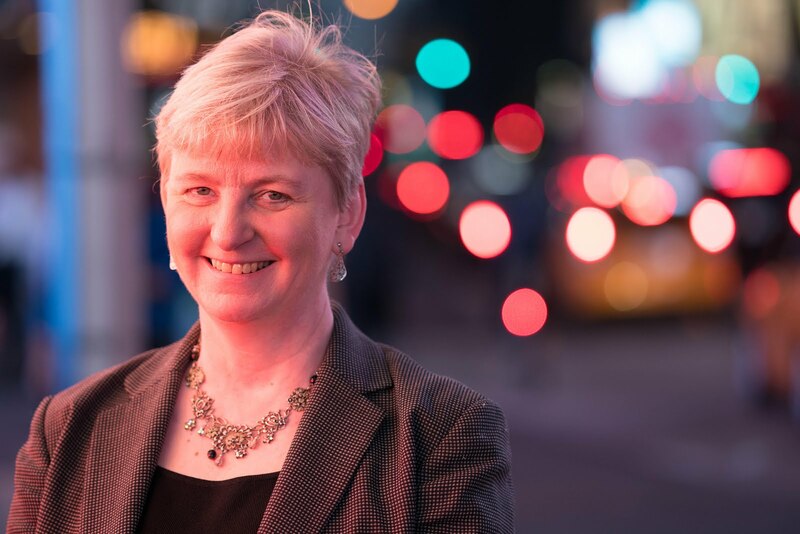 The marrying part is not for lack of trying, however, on the part of Rosemary, (Messing, who manages an impressive Irish accent with the help of Dialect Coach Stephen Gabis). She's been trying to let Anthony know she's interested ever since they were youngsters, but something always seems to hold him back. As Tony contemplate plans to sell his farm to a cousin, he talks about the future and death with his newly widowed neighbor, Aoife Muldoon (Dearbhla Molloy) and discovers that a strip of land he'd sold to her husband now belongs to Rosemary. That could prevent him from being able to make the real estate transaction. Time passes and the elder Reilly's health fails, prompting a moving reconciliation with his son that explores the depths of family relationships and the capacity for all of us to forgive. What seemed the actions of a harsh, dissatisfied man, might really have been the act of a compassionate father trying to make his son happy. As time continues to pass, however, it seems Rosemary and the shy object of her affections might never get together until Anthony takes a step of faith and shares with her about voices he hears out in the fields and a scary truth about himself that has prevented him from pursuing their relationship. This revelation, startling and at first, unfathomable and humorous, steadily takes hold as Shanley's brilliance shines through and we realize Anthony's secret is a metaphor for the quirks we all have in our personalities that make us feel unlovable. It's a sweet, touching tale told in lyrical prose by a master storyteller who makes us laugh until we cry. Doug Hughes directs excellent performances and engages a stellar creative team: John Lee Beatty, sets; Catherine Zuber, costumes; Mark McCullough, lighting; Tom Watson, hair and wig design, and original music and sound design by Fitz Patton. My one pet peeve: the rain doesn't look natural. 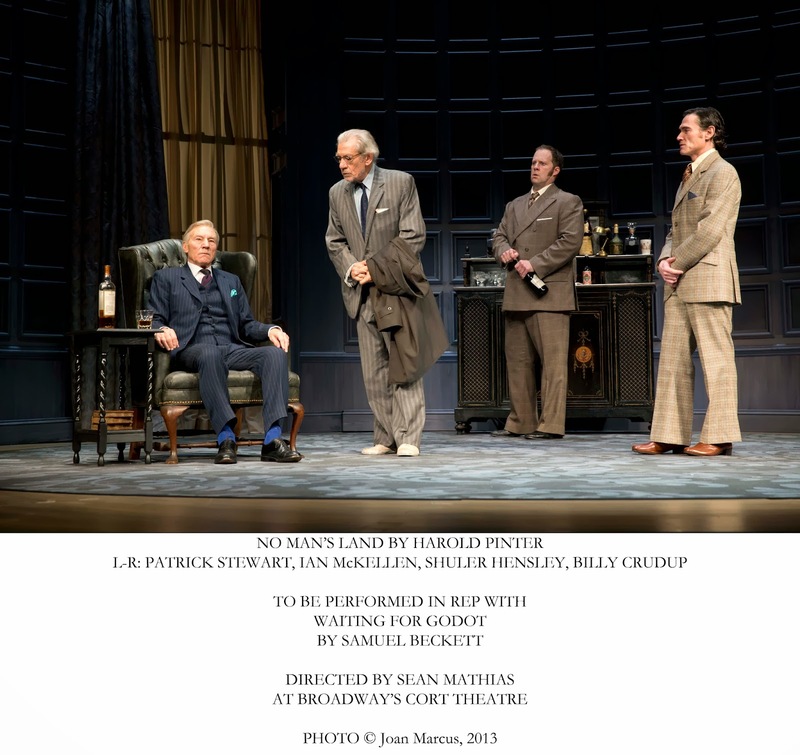 I really am not a fan of Samuel Beckett's Waiting for Godot, so when another Broadway revival was announced just years after one starring Nathan Lane, it seemed a little too soon to me. After all, how many times in a decade do we really need to see this odd play which can be mind-numbing at worst and confusing at best -- so much so that people can't even agree on how its title is pronounced (is it GOD - oh, or Gud-OH? -- lately the consensus is with the former. The answer to the question is, at least one more time. Whether this play is your favorite, or whether you have yet to suffer through -- I mean enjoy -- it, make this production the one you see. The performances here, directed by Sean Mathias, are so good that they make even this existential drivel -- I mean play -- watchable. These skillful actors make unlikable characters likable, nonsensical dialogue understandable and a dreary play almost enjoyable. McKellen is truly amazing. The second play doesn't have enough of a parameter to allow the actors to make it their own. The most interesting things about it for me was seeing Patrick Stewart with hair. 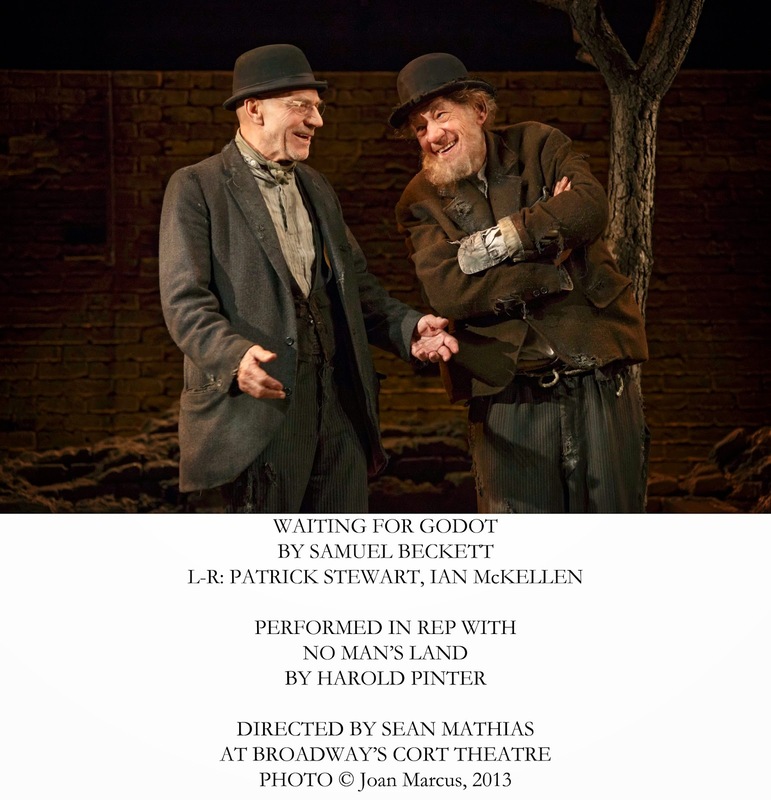 No Man's Land plays through March 29 and Waiting for Godot through March 30 at the Cort Theatre, 138 West 48th St., NYC. http://www.twoplaysinrep.com/. Civil War Re-Enactors meet in a bar following Pickett's Charge at Gettysburg and find themselves on new battlefields with thoughts about modern society and ghosts of real battles from the past interwoven to ask the question "Has Anything Really Changed?" 150 years later? The play’s title comes from Maj. Gen. George Pickett's order to charge the Union line on Cemetery Ridge. As men rushed forward and, as the defenders’ guns fired, row after row of Confederate soldiers fell to the ground, dead. Die-hard Cal (P.J. Sosko) takes issue with the not-regulation uniform of Leah (Rosie Benton), as well as women participating in the battle at all.It's 150 years after Gettysburg, Leah quips, but a woman still has to fight for a place at the table. Tom's buddy, Tom (Erik Lochtefeld), a history teacher, is less hostile and responds with wonderment to most everything with, "Wowsa." Discussions about the plight of women and other concerns of modern society play out (in nicely chosen modern colloquialism) are juxtaposed with scenes of a soldier deserting during the Civil War and a woman disguising herself as a man to go to battle. Time transitions are nicely executed with the help of Lighting Design by Tyler Micoleau and Sound Design by Broken Chord. An interesting commentary given the polarized political state of our nation. The set, designed by Clint Ramos (who also designs the costumes), is minimally built on a foundation of firewood, giving thought to how easily dissenting opinion could cause our nation to go up in flames. The script is so-so without a lot of direction. Beyond giving Leah a platform to make some passionate statements, there isn't too much plot and the ghostly element isn't thoroughly developed. 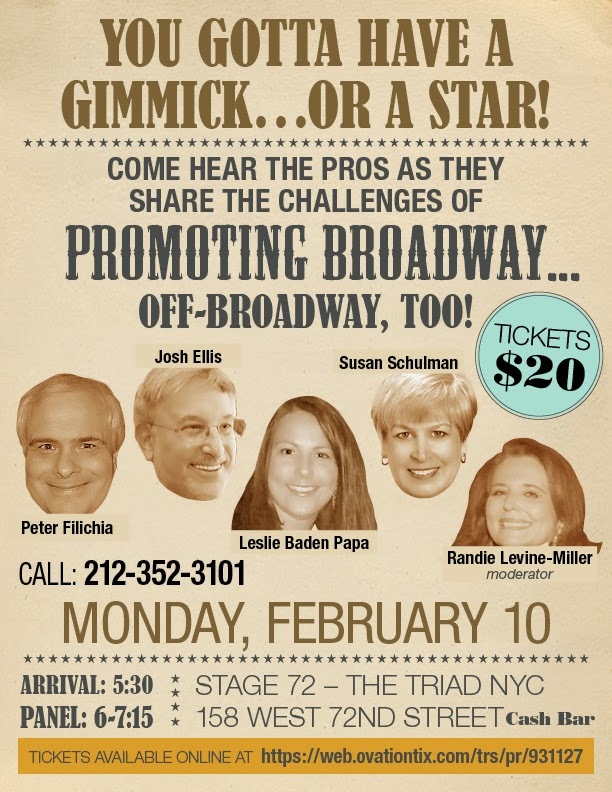 Row After Row will run through Feb. 16 at NY City Center's Stage II. Season Tickets Women's Project Theater memberships for the entire season, which includes all three main stage shows and some special events, start at $60 and may be purchased atwww.wptheater.org or by calling 212-765-1706. Single tickets are $60 can be purchased online at www.NYCityCenter.org, by calling CityTix® at 212-581-1212, or at the New York City Center Box Office, 131 West 55th St. (between Sixth and Seventh avenues). 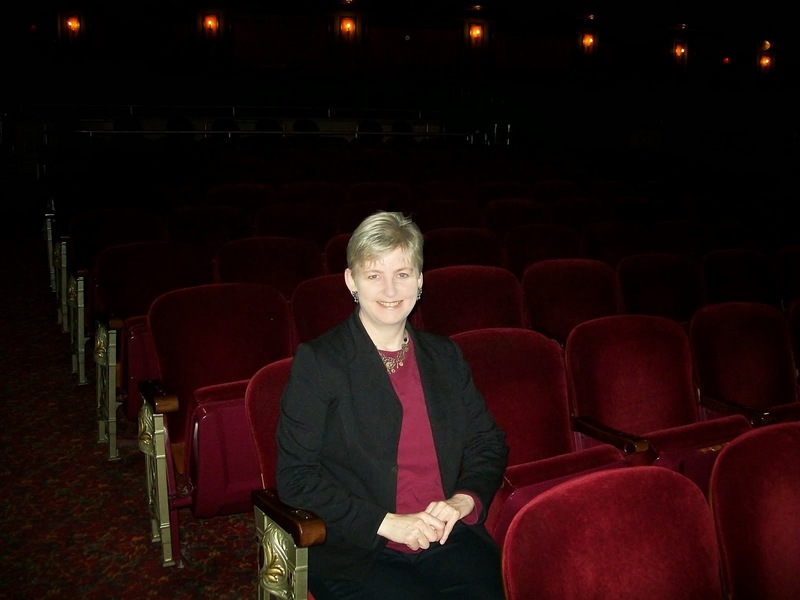 Women’s Project Theater was founded in 1978 by Julia Miles to address the significant under-representation of women in the American theater, and has since built a tremendous legacy. 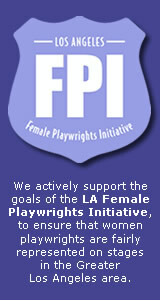 Although even today women playwrights and directors severely lack parity in pay and opportunity, the extraordinary women artists who have broken through the glass ceiling have all crossed the threshold at Women’s Project Theater, including Eve Ensler, Lynn Nottage, Maria Irene Fornes, Suzan-Lori Parks, Diane Paulus, Sarah Ruhl, Paula Vogel, and Anna Deavere Smith, among the many. 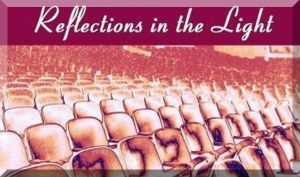 Throughout its 36-year history, Women’s Project Theater has produced and/or developed over 600 plays and published 11 anthologies of plays.